This chapter will cover the 24th century BC: the advent of the midnight Sun, the temple cultures, and the event of 2349 BC which was misnamed "the flood of Noah" in the Bible. This is a popular chapter, for the flood of Noah would seem to everyone to explain all of the strangely destroyed and overturned landscape forms that we see. But actually it explains very little. Destruction of the landscape of Earth had been going on for millions of years. All the same, the flood of Noah is addressed below, after first establishing something of the social and political environment of the era. The event of 2349 BC was probably the most impressive event ever -- and the most frightening. The next two chapters will expand on this and demonstrate that the "flood" never happened on Earth. After the visits of Horus had ceased, and as the pyramids at Giza were under construction or shortly before (about 2600 BC), Jupiter again became the most spectacular object in the sky. The planet had at that time completed its movement through the main portion of the asteroid belt in receding from the Sun, and again developed a coma, as comets do today when changing their distance from the Sun. It sported a gigantic coma, much larger than the diameter of the Moon, and a massive mountainous plasma plume from its south pole, which extended down to the Earth's horizon (as seen in Egypt and Mesopotamia). Saturn, on the other hand, had probably distanced even further, and may already have become just a mere speck in the sky. The "collision" between Saturn and Jupiter had changed the orbital speed and direction of both (actually for a total of four planets) and as a result assigned them to orbits much further away from the Sun. In effect, the movement of Jupiter and Saturn were outward bound spirals, only slowed by their travels through the asteroid belt. I suspect that Jupiter took about 890 to 990 years to finalize its orbit. The movement of Jupiter through the Solar System is detailed in the next chapter. The title of "Sun" was transferred from Saturn to Jupiter everywhere in the world. The Egyptians simply relocated their original creator God, Ra ("sun"), from the North Pole to the ecliptic. The title "Sun" for Jupiter was deserved, for after Jupiter left the asteroid belt, it would have lit up the night sky brighter than the Moon. Plutarch suggested, in circa AD 200 (in Isis and Osiris), that Jupiter was seen at first as a globe three times the diameter of the Moon. That's big. The tail of Jupiter, a plasma in glow mode, might have extended a half billion miles (800,000,000 km) away from its south pole. Because Jupiter has a very strong, but reversed, magnetic field (unlike comets which have no magnetic field), most of the plasma expulsion would leave the planet at the location of its north magnetic pole -- at the bottom. This tail is the mountain that Marduk rose on, "in the center of the sky," or, as the Egyptians describe, "in the primordial waters" -- the Duat. The few depictions we have show the plasma as a very steep mountain. A lesser portion of the plasma discharge would impinge at the south magnetic pole, located at the north geographic pole (and thus at the top), and would broaden like plumes away from the planet. This is shown in Mesopotamian images as rays emanating from the shoulders in depictions of Marduk (Jupiter). The identification of Jupiter in Akkadian depictions is certain from the banded headdress he wears, which represents the banded atmosphere of the planet. Jupiter would indeed have blazed like a sun once it left the asteroid belt. In historic times the comas of comets have managed to light the night sky to the point of blotting out the stars. Comets are only a few miles in diameter; Jupiter is 89,000 miles (140,000 km) in diameter. The Maya of classical times (AD 400 to AD 900) still called Jupiter "the Midnight Sun," as did many other peoples in historical times. The planet with its circular coma traveled on the ecliptic, where all planets travel. The mountain tail, however, would extend far below the ecliptic and seem to shine into the "water" of the sea of the southern sky, the Duat. How much of the circular coma or the mountain tail would be seen under that condition would depend on the time of year. During more than half the year the ecliptic rises above the upper limit of the Absu. Where the ecliptic dipped below the limit of the Absu, the coma of Jupiter would illuminate the Absu from behind. The central coma certainly would be bright enough to be seen shining right through the dust of the Absu. We also have later graphical images of the large red disk of Ra placed between twin mountains overgrown with reeds. The twin mountains are the Absu at the time of the equinox. When Jupiter was seen in the sky, which happened for only a part of each year, it would first be seen in the northeast or somewhere in the east, depending on the time of the year and the location of the observer. Initially it would be of a small size and would move west during the course of the night. Over the following few months Jupiter would loom larger when first seen at night, and closer to the south, and following this it would expand to its full size in the south. It would then diminish in size again, moving toward the west, and disappear for perhaps 5 or 7 months. As an exterior planet, Jupiter was not normally seen by day. Gudea of Lagash, however, claims seeing Jupiter as if during the day. Cylinder B of Gudea, governor of Lagash in the 22nd century BC (circa 2141-2122 BC), reads that Ningirsu "rose in overwhelming splendor," "in the land it became day," and "he changes darkness into light." 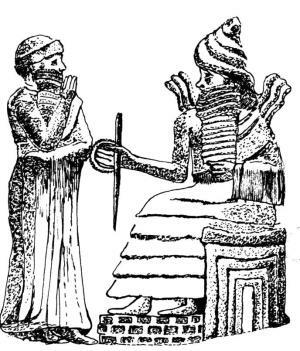 Ningirsu has been identified as Shamash ("sun") and is thought by some mythologists to be Saturn, but Saturn had disappeared long ago. This is a description of Jupiter, although perhaps a recollection (the archaeologically assigned date of Gudea's Cylinder B is a decade late). The very fact that we have these accolades almost certainly determines that the "overwhelming splendor" was not a regular phenomenon. Perhaps Gudea's acclamation resulted from seeing the additional brightness of Jupiter when it appeared above the Absu. That would happen only periodically, that is, every dozen years or so. "[O Shamash,] thou stridest over the wide and deep sea. ... Thy beams of light go down into the Ocean, and the vast mass thereof seest thy light." Here is a sun which lights up the depths of the "ocean" and walks across the sea, as could be seen in observing the Absu. And, as shown below, travels an undetermined or irregular course, and shines by night and, in fact, both by day and by night. It becomes even more amazing when Jupiter was periodically seen during part of the night and during part of the day. "Never by day dost thou cast gloom, they face never becometh dark, thou fillest thyself all the night long, and lettest light stream forth from there." This is not the Sun. This is not the Moon. "Thou dost hasten over an unknown and remote course, leagues uncountably long. O Shamash, thou journeyest by day and turnest not back by night." This is certainly not our current sun. Jupiter became the reigning god of Heaven. How long the coma condition lasted I am not at all certain. I suspect that Jupiter continued to blaze in the night skies for only a few hundred years. In the following chapter, I will suggest that the display ended completely (after one interruption) in 2150 BC. The descendants of the pharaoh Khufu, builder of the first giant pyramid at Giza, added "Re" to their names after circa 2550 BC, as did all the pharaohs of the following dynasties. "Re" is Jupiter, but "Re" is identified by modern archaeologists with the daytime Sun. ("Re" or "Ra" translates as "sun.") The first pharaohs of the following dynasty (the fifth dynasty, after 2490 BC) construct "sun-temples" on the west bank of the Nile, in addition to their own burial pyramids. The sun-temples consisted of a steep obelisk mounted on a platform, looking like the outpouring of plasma from below Jupiter. The obelisk became the symbol for Re. Only six such temples were built by successive rulers of the fifth dynasty. The sun-temples stop being built, we can suspect, after the display disappeared. The sun-temples are an indication that, during the period of the fifth dynasty (after 2494 BC), Jupiter stood in the sky as a large blazing globe. After some 50 years of these constructions (ending by 2445 BC), no additional sun-temples were ever built. We can assume that the coma of Jupiter had disappeared again. Eventually the blazing of Jupiter would have come to an end as the planet slowed its retreat from the Sun and its charge balance (electric potential) started to match the electric field of the Sun at its remote location. The next chapter will suggest a sudden final extinction of Jupiter and a blazing fire. That happened in circa 2150 BC. By that time Jupiter had stood as the Midnight Sun, except for two interruptions, one long and one short, for a 1000 years. In both Mesopotamia and Egypt, the planetary Gods (which still included Venus, Mars, and Mercury) were now understood to travel along the river of the ecliptic and across the ocean of the Absu (Duat) by ship. How else could one travel over a sea? Since the rings of the Absu consisted only of thin layers of dust and gases, a bright object behind the Absu, like a planet, would cause a glare to spread in the horizontal direction. It would at least have looked as if the planet was being transported on a raft with sharply upturned stern and bow. After the fall of the Absu (in 2349 BC) only a single upper ring remained, so that planets would still be seen on a raft where the ecliptic crossed (fell below) the ring. Even in Roman times, all the Gods of Egypt were still shown in ships. It had become the proper way to depict gods. It is very likely that the last ring of the Absu remained in view through the Middle Ages of our era. It is the Uoroboros of medieval alchemists. 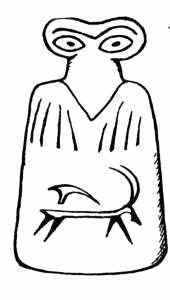 For 3000 years the Gods were depicted in ships in Egypt. There are pottery depictions of celestial ships from before 3147 BC, but these portray the ship seen in navigation around the globe of Saturn as its bright crescent (as Talbott has suggested). During the time of the three Kingdoms of Egypt, statues of the Gods were ferried up and down the Nile to visit Gods at other temples and carried in processions in boats. The deceased also had to cross the sea of the southern sky, a concept already well established before the first Egyptian dynasty. Complete ships were interred adjacent to pyramids; two have been found next to the pyramid of Khufu (Cheops) at Giza. "Virtually every mythical form of the sun god's dwelling -- be it mother-womb or world wheel, city, temple or kingdom, egg, throne, or circular serpent -- was declared to be a 'ship' sailing on the cosmic waters." "It is not surprising, then, to find Scandinavian rock carvings showing the wheel of the sun resting in the cosmic boat, or to discover that -- from Assyria to Britain and from India to Polynesia -- images of cosmic ships either contained wheels or were set on wheels and conveyed around dry land in the rites. As symbols of the sun god's enclosure, ship and wheel merge as one." Talbott ends up relating the disk (wheel) and ship to the crescent seen rotating along the edge of Saturn during the "Era of the Gods." But the ship with a disk or globe was also an image seen in the sky after the close of the "Era of the Gods." To the ancients the Absu or Duat was a "sea" without question and seeing the planet Gods traveling through this sea on a flat skid or in a boat was real. The flat skid shape is the natural result of the radial spokes in the rings of the Absu, which result in reflective marks perpendicular to the spokes, and a quarter wavelength removed, as any photographer will verify. Because the Absu thinned out above the brightness of a planet there would be a lesser reflective mark above the image of the planet. This explains the long persistence of the "ship" imagery. "Red was the mat on which Bolon-ti-ku [Jupiter] sat. His buttock is rounded [shaped] like a hat, as he sits on his mat." After an annual disappearance of some months, Jupiter would first be seen again in the east. Many people watched for the appearance of the red star of the east. The Saturnian researchers have had problems with the identity of a Red Morning Star, and have all but suggested that Mars at one time might have been on an orbit between the Earth and the Sun, similar to Venus. North American Indians (the Pawnee) paid tribute to a morning star which was red, for which neither Venus nor Mars would properly qualify: Venus was not red and Mars was not an inner planet, even if it overran the Earth's orbit. Jupiter, however, had a massive red coma. In the early 20th century it was suggested that Mars would have been the red star. The appearance of Mars in the east was checked against Pawnee festivities for the period of AD 1800 to AD 1900, but the festivities happened only at 9 or 10 year intervals. Mars is overtaken by Earth (making Mars appear in the east) every two years. The original "red star" was Jupiter, which was overtaken by Earth every 12 years (today), but at a reduced interval at an earlier time, when Jupiter additionally would have been very large and very red. The progress of Jupiter across the heavens is so slow that Earth catches up with a sighting of Jupiter in the sky. During a portion of its travels it might appear during the day or part of the day. Jupiter was certainly bright enough to be seen in daylight. Each following day (or night) would bring Jupiter higher up into the sky, since the Earth traverses a zodiac house (30 degrees) in a month whereas Jupiter would require a year to do the same. Jupiter had a calming influence. Over 3000 years he never lost his status as chief God. He also never showed unexpected behavior, unlike the inner planets -- the other Gods. These secondary Gods visited Jupiter frequently, that is, they were seen in the same sector of the sky, but Jupiter only slowly moved from one zodiac house to the next over the course of a year. And he remained on his mountain. The "Era of Kings" started with a legacy from the immediately preceding "Era of the Gods" and we can therefore assume that these times started with the initial expectations of the resumption of a good life, order and purpose, and a working economy. However, none of these were initially forthcoming because of the interruption of the flood followed by the absence of guidance from the Gods. Only the temple culture, which had been in charge of the economy in the previous age, provided a unifying direction. The priests were called upon to explain what the Gods had done, why they had left, and what could be done in their absence. The solution to the void left by the departure of the Gods was the installation of a king as the steward of God or as the God himself. This happened simultaneously in Egypt and Mesopotamia. It cannot be stressed enough what a radical change was made in 3100 BC when civilizations with no apparent leadership became kingdoms and theocracies. The need for authentication and authority must have been intense. Simplistic as this might seem, all indications are that this was sincerely believed by the people and by the priesthood and the kings. Both Sumer and Egypt used languages with a grammatical structure which looked only to the past and which in effect held that the future was something one backed into. And with such a reversed sense of time and the inability to imagine alternatives, the mandates of the Gods and their earthly representatives were inarguable, and answered questions for the masses, at the same time providing justification for the governing elite. Is this the legacy of the "Era of the Gods," during which humans had learned to manage large farming and trading concerns, and had invented the wheel, bronze metallurgy, irrigation, and writing? You would expect a continuation of new ideas and advances. And, in fact, there are some. For one thing, the politics of the city-states continued to evolve. Larger and much more complex irrigation projects were instituted. In Sumer, trade was expanded to include the import of metals from the region beyond the Zagros mountains, wood, stone, and obsidian from Anatolia, and other products from India and East Africa. Egypt expanded its territory to control copper mines in the Sinai, transport of basalt blocks from as far south as Aswan, import honey from Crete, and lumber from Lebanon. There were changes and large improvements in ceramics and in bronze metallurgy. However, there were no changes which did not proceed directly from a previously known process. There was a lack of imagination compounded by the turn to conservatism in the solidification of social structures, reinforced by the rapid rise of a privileged elite and the ever-expanding religious rites and superstitions. It is this last, the overwhelming obsession with the multiple Gods, spells, ceremonies, and religious practices, which remains foreign to us today. And, as Julian Jaynes notes in his book The Origin of Consciousness in the Breakdown of the Bicameral Mind (1976), it is completely at odds with the expectation one would have for a people descended from Paleolithic hunters with their ever-expanding production of art and tools, or the ingenious farmers and villagers of the Neolithic who developed fishing, herding, and farming. Yet, the preoccupation with the demands of the Gods remains the central issue of the later civilizations for over 3000 years. Is Jaynes on track? Something certainly was missing in Mesopotamia. "From its beginnings in Sumer before the middle of the 3rd millennium BC, Mesopotamian science was characterized by endless, meticulous enumeration and ordering into columns and series, with the ultimate ideal of including all things in the world but without the wish or ability to synthesize and reduce the material to a system. Not a single general scientific law has been found, and only rarely has the use of analogy been found." Describing a similar lack of the ability to conceptualize, I.E. Edwards's book The Pyramids of Egypt (1985) reads like a comedy of errors when it comes to the details of the construction of the pyramids of the Old Kingdom (Dynasty 4 through 6, 2700 BC through 2200 BC). One structure after another was obviously interrupted by changes in the plans. What the book describes, over and over again, and over a span of hundreds of years, are obvious changes in construction after considerable work has been completed. Subterranean tombs and access Tunnels are frequently re-excavated or moved to a different location. This happened with the exterior buildings as well (the valley building and mortuary temple). Walls and building extensions were added and subtracted almost arbitrarily. I am not talking about the inferior completion of a pyramid, or failure to complete the pyramid of a predecessor, or the theft of materials from an existing pyramid in order to complete a later structure. And it is not that the Egyptians could not measure accurately. The pharaohs oversaw the work on their graves closely, often relocating to the site of the construction. The crews could locate a tomb room exactly under the apex of a pyramid when required to do so. However, rarely are the first efforts at digging the subterranean structure correct. Everywhere we see changes in direction, blind corridors, abandoned rooms (and not just for the purpose of foiling potential grave robbers). Although inconceivable to us, it seems that the overseers lacked the imagination to incorporate the details of a structure into a single unit, and frequently could not coordinate the excavation crew with the pyramid crew (although, overall, an enormous amount of work was completed). This failure of a complete overview, the inability to simultaneously see the details and the complete picture, extends to art as well. It is apparent in the images of Sumer and also in the standardized Egyptian depiction of the human body on flat surfaces showing a frontal trunk but with the head and legs in profile. This was noted by Jaynes, who adds that this is also especially to be noted among early Greek two-dimensional figures, which are often shown as curiously disarticulated groupings of arms, legs, trunks, and heads. This does not extend to three-dimensional art. Even the earliest Egyptian sculptures in the round were totally realistic, even if somewhat idealized. The method of overcoming this failure in imagination, Jaynes proposes, is through an extended use of metaphors. The primary trope is analogy, a space in the mind which is mapped to the equivalent space in the real world. With the addition of an imagined self inhabiting this imagined space, we are suddenly presented with ever-expanding possibilities of imagined actions in these places, interpretations of the effects of the imagined actions, and even the design of tools imagined as solutions to problems. We, in our age, do this sort of mapping to a mental space with past, present, and future experiences, testing the efficacy of possible actions by stepping through them in our mind. We also lay out time and mathematical concepts as viewable "spaces" in our mind. Jaynes's concept (in brief) of consciousness -- more precisely, subjective consciousness -- is exactly this placement of an "imagined I" into imagined spaces in the mind. It is not actually "you," but a substitute, an analog. You can look through the "eyes" of this "substitute I" or even observe yourself from afar in your mind. If something in real space and time requires your attention, the "I" will shift to be located directly behind your real eyes. Note that, as so defined, "memories" (as we imagine recollections) and "self-awareness" are not part of "subjective consciousness." These are biologically determined and are common to all animals. Jaynes suggests that historically, subjective consciousness was a late and learned acquisition for humans. Subjective consciousness is learned, and is culturally transmitted. Some people never learn it, yet they will appear fully functional. And, if not from parents, how is such subjective consciousness learned? It is also learned from meeting strangers (not friends and familiar faces), an experience which forces upon you the idea that others see you, and thus suggests a narratized space in the mind where you can see yourself being looked at by others. This reflected "analog I" becomes the first spark to light up the enormity of possible analogical mind-spaces which compose subjective consciousness. Jaynes claims that in the Middle East subjective consciousness didn't develop until after 1500 BC. In the immediate 2000-year period after the "Era of the Gods," which had still looked with certainty towards the beginnings, subjective consciousness simply was not needed. As long as nothing changed, life was predictable and safe. It took a number of worldwide catastrophes, which Jaynes did not address and was not even aware of, to force a change. Their constitution has stood them well for 400 years. We also have to wonder at the myths and legends which have come down to us, since the lack of subjective consciousness precludes detailed memories. We can all verify this for ourselves, for we remember little or nothing from the first few years of life -- when we lack language -- and little from before the age of seven or eight -- when we lack the imagination to embroider remembered experiences, unless these were outstanding or later retold to us. This suggests that mankind would not be able to recall its early history except for unusual experiences, and further might suggest that the myths and legends are fabrications of a later age. But, just as we remember some events from childhood if they are retold to us (or to ourselves), so humans would also have been able to recall stupendous past events if these were retold or replayed. The adoption of subjective consciousness seen in the Middle East beginning after 1500 BC is also accomplished in India and China at about the same time, and likely due to similar causes. Did anything like it happen in the Americas before AD 1500? The problem with finding an answer to that question is that we only know the story from the invaders. Jaynes noted the striking similarities between the Middle East of 1500 BC and the Incas of South America of AD 1500. The parallels between the Inca emperors of AD 1500 and the pharaohs of third millennium BC Egypt are astounding, despite a separation of 3000 years. For the Inca emperor, as for the pharaoh, the purpose of life was union with the Gods. When the Spanish threaten one of the Inca cities, the Incas flee, leaving behind their gold, belongings, and food, taking only the mummies of their past god-kings to hide them in the mountains. We see the same in Egypt where the priests frequently remove mummies and hide them elsewhere when threatened by grave robbers at times of unrest. Consciousness, on the other hand, is located almost entirely in the left rear brain, as is also the ability to understand the speech of others and the ability to produce grammatically correct responses. The left brain is not aware of the right. This is, in fact, extensible to all right cerebral activities, most notably to mental dysfunctions. Oliver Sacks details this in case studies, in The Man who Mistook his Wife for his Hat (1970). We live in our consciousness, unaware of the input from the right hemisphere. Bicameral kingdoms have a number of features in common, including the following. First, there was either a city God, with the city and surrounding area operated as a theocracy, or a king, who was held to be the God or the Son of the God and was revered as such, even after his death. Theocracies included Sumer and, later, Akkad (in fact, all Mesopotamia remained as theocracies up to Persian times), India, China, and all of Mesoamerica. Societies under the direct rule of God or the Son of God included Egypt, Japan, and the Inca empire. Third, the kingdoms of the "God on Earth" were jealous of any competing Gods, including those which had come before, and would destroy all signs of the preceding Gods, just as the cities of Sumer and Akkad would readily attack their contemporaries and haul off the God statues from the temples of nearby cities. The destruction of all previous records by edict of the Emperor of China in 213 BC is an example. The Aztecs destroyed all the manuscripts of their predecessors in the Valley of Mexico shortly after AD 1400. The priests who followed the Spanish invaders into the Yucatan in the following century burned all the books of the Maya. Fourth, the citizens were incapable of deceit, or more fundamentally, incapable of imagining the deceit of others. Not that these people could not lie or steal, but they were incapable of mentally "narratizing" a complex series of deceptive actions either by others or by themselves. This is vividly illustrated with the Inca empire, which had subdued half the South American continent, only to fall to the deceit of a handful of Spanish soldiers. As a corollary it should also be noted that these people had no morals -- there was no such thing as good or bad. Actions were ordered and the humans responded like robots. The heroes of the Iliad were motivated by glory and shame, without regard for their own life, as were the Spartans who held off the Persian army at Thermopylae in 480 BC. In the vacuum left by the departure of the Gods, religion had substituted prescribed duties for individual judgment and assumed the absolutist attitudes understood as the prerogative of the earlier Gods. What is absolutely astounding is that these attitudes lasted over 4500 years after the collapse of the "Era of the Gods" -- as in the case of the Incas, for example. But pre-subjective people are entirely functional humans. They can learn anything, including any skill, reading, and mathematics, they have the same sense of humor as the rest of us, they experience and express emotions, and they can converse with others in intricate details. It is difficult to distinguish bicameral humans from subjectively conscious humans. You will find yourself persuaded by each of the long soliloquies of the war chiefs of the Iliad when they meet in council -- yet no one among them takes action without receiving a command from a God. Bicameral humans seem normal. However, they rely heavily on the learned admonitions of parents and authority figures (blurting things out without any forethought, invariably in the context of "ought" or "should") and have great difficulty with novel situations. New situations require the ability to imagine a number of alternative actions which might be taken and then to make a selection based on the imagined results. A pre-conscious human does not have the ability to imagine the thinking of others, especially reflectively; that is, how others might imagine them as thinking. There is a disturbance in 2349 BC, 800 years after the flood of 3147 BC. There are changes in climate, noted by many researchers, perhaps to a limited extent in the Middle East, but apparently also in China. This is followed about 150 years later by an extended period of drought and dust storms, starting in 2193 BC. From the interval of 156 years between these two climatic events, we would conclude that Earth was four times involved in an encounter with Venus, on a cycle of 52-year intervals. The interval of 52 years between events becomes a clear hallmark of disturbances by Venus and both 52-year and 104-year intervals between certain events are remembered by other nations at a later date. The 52-year cycle is assured, even for remote antiquity and even though the Earth's orbit would be different. See Appendix B, "The Celestial Mechanics," for how the interval can be derived for various periods in the past. "The great perturbations which left their traces in the stratigraphy of the principal sites of the Bronze Age of Western Asia are six in number. The oldest among them shook, between 2400 and 2300, all of the land extending from the Caucasus in the north down to the valley of the Nile, where it became one of the causes, if not the principal cause, of the fall of the Egyptian Old Kingdom after the death of Pepi II." Schaeffer's estimate brackets 2349 BC, the first strike by Venus. The "traces" of 2400 BC to 2300 BC extended over a very wide area in the Middle East, from Persia to Greece, and included "violent earthquakes and tidal waves, and other signs of a natural disaster" (paraphrased by Velikovsky). But it becomes obvious that what we are seeing is a swath of destruction only extending over part of Northern Iran, Anatolia, part of the Levant, and Greece, with little or no evidence in Mesopotamia or Egypt (despite what Schaeffer wrote about "the Nile valley"). It would seem that the event of this era caused an expanding circle of destruction throughout South Central Asia (the location of Indian civilization), the Eastern Mediterranean, throughout Southern Europe and parts of North Africa, plus China. Other areas we are not aware of, because they were not built up with cities. There is little indication that the seismic shock crossed the Atlantic to make contact with America. Worldwide, the destruction in this instance seems to have been limited to earthquakes. At the first instant the crust of the Earth would have been subjected to a severe compressive force due to the electric repulsion between Earth and Venus -- but only for a period of a half hour or less. The compressive forces would have been followed by lifting forces as a result of an induced charge of opposite polarity. (More on the sequence in Appendix B, "The Celestial Mechanics.") Areas adjacent to the "impact area" would have experienced an uplift initially. Areas outside of the region of the initial "contact" would have been subjected to lateral seismic forces (earthquakes) as seismic shock waves spread around the Earth. The destruction described by Schaeffer apparently pertains mostly to the end of this period, 2193 BC, when agriculture fails worldwide. There seems to be no evidence of large-scale fires at the earlier date of 2349 BC. The damages noted by Schaeffer (he only presents information for the region west of the Himalayas) were due to seismic waves resulting from the initial compressive force to the part of the Earth that faced Venus, followed by somewhat later lifting forces. The earthquakes would have been astounding. The contact with the plasmasphere of Venus would have resulted in an attempted charge equalization through the delivery of lightning bolts. At a closer distance between the two planets, such massive lightning strikes would have been capable of melting mountaintops, ripping out and incinerating forests, and lifting boulders and hilltops into the vortex of a fiery hurricane which would have moved west at over 500 miles per hour (800 km per hr), which is the linear speed of rotation of Earth at 30 to 40 degrees latitude. Traveling lightning bolts would have incinerated forests and grasslands, resulting in placing nanometer carbon dust in the stratosphere, with a resulting shadow extending over all of the Earth for centuries. But in 2349 BC, there was nothing like that, as far as we can tell. This was not a traveling lightning strike, for there was no close electric connection to Venus. The planet was 20,000,000 miles (32,000,000 km) away (probably 17.5 million at a minimum, see later calculations). In 2349 BC there was no follow-up lightning strike. This was an unusual condition and unexpected, but kept the Earth from experiencing the massive forest fires resulting from a traveling arc, and the darkness which could have followed the fires for hundreds of years. But, as mythological sources in India, Canaan, Mesoamerica, and China have it, the charge equalization consisted of a plasmoid arriving from 20,000,000 miles away. The event of 2349 BC did not result in a darkening of the skies as would be indicated by a failure of agriculture worldwide. We would also have to assume that the plasmoid dissipated at the Van Allen Belts or the ionosphere. The charge which held the dust of the Absu in suspension may have saved the Earth from being incinerated. In this case, where the plasmoids had to travel a very large distance, the charge equalization (the thunderbolt) would have arrived late. The first plasmoid from Venus took six hours to arrive (in my estimate). See the chapter "The Day of the Dead," for details of travel time and speed. Also, from descriptions we have, it looks as if the initial gigantic plasmoid was followed by 9 smaller ones. This too, is expected for such a very remote interaction. However, there was of course a "flood" thought to be associated with this electric contact, for it looked as if the Absu fell and drained onto the Earth -- although actually discharging to the upper atmosphere and causing severe rain storms. The disappearance of the "sea" of the Absu would have been enough to convince everyone of where the rain and storm water came from. The event was understood everywhere as a "flood" from the sky -- in the Eastern Mediterranean, in China, in the Americas. From the damage done in the Eastern Mediterranean north of about 33 degrees latitude we know that the initial repulsive blow from Venus was delivered north of the equator, and the Earth's rotational axis would have undergone a gyroscopic reaction as the northern hemisphere was shoved away from the Sun. Thus the path of potential destruction (as an arc was delivered) would have traveled at an angle inclined to the equator, so that Western North Africa could have fallen on the path. By the time Central America faced Venus the gyroscopic reaction would have started to carry the equator back "down" to where it belonged, so that the remaining path of destruction angled up again. I'll develop more details in the next chapter. The second appearance of Venus in 2297 BC and the third in 2245 BC seem to have left no record that we are aware of. Yet it is certain that these happened. People took no note in myths and histories because the results were not spectacular or religiously significant. The last event in 2193 BC will be discussed separately below. Again, as with the previous two, the contact in 2193 BC was not noted in any records. But in this case we have substantial secondary data available. The story of Noah and the flood is well known from the Bible. But, as I pointed out in a previous chapter, flood stories are ubiquitous. People in all regions of the world have flood stories. Most of these stories show no signs of having been borrowed from other people, yet they all involve the same elements -- a worldwide inundation, survival of a few people with their animals in an ark, a boat, or a canoe, and anchorage at a mountain while waiting for the waters to subside. When the Sumerian Epic of Gilgamesh became available in translation in Europe in the 19th century, it astounded everyone -- for it contained a clear description of the events of the flood of Noah, including the ark, the animals, and sending out birds to test for dry land. However, both the flood of Gilgamesh and the flood of Noah are the conflation of the Black Sea flood of 5600 BC and the World Flood of 3147 BC. In 5600 BC, Noah didn't build an ark. As a Black Sea fisherman, he had a boat. He didn't collect all the animals in the world, only his family and farm animals, and as much seed and fodder as possible. He didn't moor at a mountain in Northern Iran, but landed at the river Halys or rounded the Anatolian plateau to land in the depression between the Pontic Mountains (bordering the Black Sea in the south) and the Caucasus Mountains (to the east of the Black Sea). From there, his "survival story" spread south into Iran and Anatolia, eventually to reach the plains of Mesopotamia and the Levant. After another flood and the passage of nearly two thousand years, the ark was the Sun-lit crescent on Jupiter, and the mountaintop of the anchorage was the lower plasma tail of Jupiter, decked in green. But they had been seen by all. To the Hebrew priests who compiled the books of the Bible after 536 BC, the flood was an actual event experienced in 2349 BC. It was, for them, the only flood ever and the centerpoint of their people's history. However, the date, although widely accepted among Christians since Bible chronologies were established in the 17th century (Ussher and Newton), is backed up by very little physical evidence. (I will return to this in the next chapter.) Some think it may have been a local event. We are not even certain where in the Middle East Noah was to be found in 2400 BC. It might have been Anatolia, Mesopotamia, or the Levant, or even Arabia (with some scholars suggesting India). The Jewish world history (the Bible) was compiled sometime after 536 BC, when Cyrus allowed the Jews to leave their Babylonian captivity and return to their homeland with orders to rebuild the temple of their God. Cyrus financed the rebuilding and returned to them the "vessels of the temple." We could presume that their books and records were returned with these. The earliest of these books, Genesis, which includes the story of the flood of Noah, was held by tradition to have been written by Moses a thousand years earlier, after 1490 BC. The priests subsequently edited and collated their books into a history of the world -- a creation epic. The editors must certainly have been familiar with the thousand-year-old Babylonian Enuma Elish creation epic, which at that time constituted the only other recorded history of the world from creation onward. (The Enuma Elish retells the flood stories found in earlier Sumerian epics.) But the Enuma Elish dealt with multiple Gods, and the Hebrews were monotheistic. I would also assume the editors knew the epic literature of Akkad and the King List of Sumer. We would have to assume that the Bible editors knew that the list of the "Kings before the Flood" was recorded in days, not years. And it would have been known by the editors that in a previous era the year was shorter (having all but witnessed the change in the year's length which happened in 747 BC), and that it was even shorter in earlier times -- or, in another way of understanding, that people lived longer lives. Their sacred book would certainly conform to these oldest known histories of the world, but would be populated with their own patriarchs and informed by their own records. The history of the world as presented in the Bible is, at any rate, unique. It presents a record of creation which parallels the Mesopotamian creation epics (and those of many other people) but conceives of a God outside of the visible domain of this world. This last is the result of a change in humanity's point of view on the Gods seen throughout the world after 650 or 600 BC, which will be discussed in a later chapter. Adam is the lonely globe of Saturn in the sky. God -- the God outside of creation -- takes pity on him and creates a woman for him by extracting a rib and subsequently healing the wound. This is clearly the image of the expulsion of Venus from the side of Saturn, still connected with a rib-like plasma appendage. The image was common to the experience of all the tribes of the Eastern Mediterranean, but the interpretation by Moses was unique. The "flood of Noah" happened as the Earth's orbit increased and Earth joined the Moon at the Moon's established orbit. The result was that the Moon revolves around the Earth in a plane tilted up at about 5 degrees (as seen from Earth) -- not on the Earth's equator, but otherwise at the same average distance from the Sun. I suspect (from the records presented as sculptures at Maya Palenque) that the Moon did not fall into a regular orbit until 2283 BC, some 50 years after it first appeared. The Chinese Shu King claims it took 30 years. The appearance of the Moon probably marks the "sign in the heavens" after the flood of the Bible. It is the end of the "time before the Moon" noted by Aristotle and others in antiquity. "Sin" ("Moon") becomes popular as a personal name in Akkadian Mesopotamia after 2350 BC. Sargon of Akkad, who conquered Sumer shortly after "Noah's flood," appoints his daughter as priestess of the Moon god ("Nanna" in Sumerian) of the Sumerian city of Ur. His granddaughter held the same position. The heavy clouds did not rain"
-- City of Akkad, circa 2100 BC. Some climatologists have assumed that Mesopotamia and Egypt lacked rains during this 200-year period following 2193 BC. But the laments from Akkad, quoted above, do not speak of a lack of water, but of a lack of growth. This speaks of a downturn in temperature and, most likely, a lack of sunlight. It is very similar to the darkness which will envelop the world 700 years later, after 1492 BC, when the Hebrews "walked in darkness" and Mesoamerican recollections claim that a generation of people grew up in darkness. An oceanic strike of an arc from Venus traveling partway around the world would not have produced a cloud cover lasting for years. But an arc traveling across the land of Earth would cause extensive fires. This is probably the most likely cause for the 200 years of darkness. The strange specificity of the area of destruction in the Middle East has suggested an air blast to some researchers, perhaps a Tunguska-like meteoric event -- an exploding bolide arriving from space. But most likely the two disturbances of 2349 and 2193 BC, the flood of Noah, the later demise of the Old Kingdom of Egypt along with the collapse of Akkad, were caused by the electric interactions of Venus. The restricted path of destruction, the damage caused by fires (also localized), the tilting (gyroscopic swing) of the axis (which is recorded in legend in China and as history in Mesoamerica), and then the later blockage of sunlight for an extended period of time, are all the marks of an alignment with a large planet and its electric field interaction with Earth. I will offer some additional details in the next chapter. After a few hundred years, Egypt will reorganize as the Middle Kingdom and start in again to build pyramids as grave markers and will do so for another thousand years, spreading ever further south along the Nile. Akkad and China also recover. The Harappan cultivation of the Indus valley is abandoned as its people move into the Ganges region. In the next era, Mercury will become a prominent God while Venus will continue to lurk in the background. In the next chapter I will turn to some additional important considerations of the events surrounding the "flood of Noah." "And also they caused him [the deceased] to carry a little dog, a yellow one; they fixed about its neck a loose cotton cord. It was said that [the dog] bore [the dead one] across the place of the nine rivers in the land of the dead ... And when the four years had ended, thereupon [the dead one] went to the nine lands of the dead, [where] lay a broad river. There the dogs carried one across." As I have already pointed out in previous chapters, the "nine rivers" are the Mesoamerican equivalent of the Duat, called the "House of Nine Bushes" in the Chilam Balam. The "broad river" is the ecliptic, which was noted as appearing about "2 or 3 degrees wide" in the early 19th century of the current era. In the 16th century AD the river of the ecliptic was still visible. As I have pointed out earlier, for Jupiter to have looked the same diameter as the Moon, at the eventual location at 5.2 AU from the Sun, with the Earth at 1 AU from the Sun, the coma would have been nearly 3.5 million miles in diameter (using the tangent of 1/2 degree for the size of the Moon). The dark mode plasmasphere of Jupiter today is still 3.5 million miles wide (5.6 million km). A coma of this size would have encompassed the Earth if it had developed before Jupiter entered the asteroid belt -- but without ill effects to Earth. Because the asteroid belt provided multiple targets for plasma discharges, I do not think a large coma was needed as Jupiter traveled to the end of the belt at a distance of about 4 AU from the Sun. If Plutarch's Zarathustrian sources are correct, and Jupiter initially looked to be three times the diameter of the Moon, then when Jupiter first exited the last clump of the asteroid belt at about 4.7 AU, the coma would at that time have had a diameter of 10 million miles (16 million km). "Rounded like a hat" can also be read as "sharply pointed" or could mean "shaped." The 16th century AD Chilam Balam dealing with ancient celestial phenomena apparently copied from illustrated glyphic bark books of great antiquity. We are here encountering a verbal description of an image for which the physical basis had been lost to memory. The "pointed hat buttocks" is probably a reasonable description of a depiction of the coma extending from the bottom of Jupiter. "Sitting on his mat," however, is normally considered as a metaphor for rulership. City walls are not necessarily for defense. The first use of walls around compounds of buildings was probably to protect cattle or sheep from predators, like the "kraal" of 19th century Zulu villages, or as flood control. Lions roamed Persia well into Roman times, and would probably make excursions into the Mesopotamian lowlands for a kill. But it must have become obvious before long that walls would also keep people from neighboring cities out. The walls around Jericho are a curious exception if seen as protection, as is the Jericho tower, since they were built much too early (6000 BC). It could be suggested that the tower was built to observe the southern ball plasmoid. In that case Jericho is no longer a cattle-trading town, but a religious center. One might question the genesis of the planned cities arising in Mesopotamia and the Indus valley which seem to spring into being with no previous examples. The beginnings of the Harappan culture has not been dated, since earliest levels are below ground water. But I would suspect them to date to after 3000 or 2700 BC. This culture had examples of earlier cities -- in Iran and Baluchistan. The first cities in Southern Mesopotamia appear after 2700 BC, maybe earlier. They follow on earlier small villages and individual housing. Mesopotamian cities may have been derived from Iran, and certainly from the cities in Anatolia. We should distinguish between villages and cities. Villages are a function of the availability of resources. If you live in a river valley where there is water, where you can plant, and surrounded by forests where you can hunt and cut lumber, it makes sense to settle a village near the water and farm land even if there are no more than a few families. People only live together when it makes sense to do so. Villages in forested Central Europe after 5600 BC are all located along river valleys. Cities, on the other hand, are by and large based at a central temple, which soon become the centers for the manufacture of goods for trade. The temple compounds often precede the city, as for Uruk in Mesopotamia which is built adjacent to the earlier temple E-ana. Similarly in Egypt, and in Mesoamerica, it is the ceremonial centers which precede cities. In Mesopotamia the cities were built by an immigrant people who had already lived in grouped houses (perhaps in Iran) for over a thousand years, or who may have come from Anatolia which boasts numerous cities much older than the Sumerian culture in Southern Mesopotamia. They moved into the flatlands of the Euphrates and Tigris because of the potential productivity (discovered earlier by local people). Much the same happens with the Indus valley Harappan civilization. These people had moved out from Baluchistan and probably also from the foothills near the source of the Indus and Ganges. It looks like there was a sudden increase in population after 3100 BC in the agricultural centers of the world. As the climate became drier and colder, there were mass migrations of people from lands where the archaeology suggests more primitive conditions for housing, but not with respect to agriculture and animal husbandry. When groups strike out to new lands they are organized and naturally would plan their "new" cities with some reasonable order. Having lived elsewhere in cities which had grown in helter-skelter fashion, it can be understood why the new cities were carefully planned in a grid fashion, and, as for example in the Indus valley, which were built from the start with sewers and running water. This is not a case of foragers suddenly settling down. The foragers were probably largely killed in 3147 BC when coastal regions and lowlands flooded. Even if people survived, the game probably did not. The survivors of the flood are to be found in mountainous regions and far inland away from seas, coasts, and low areas. The farmers who suddenly appear after 3100 all come from the slopes and foothills of mountains. The survivors are those who had already learned to plant in addition to "gathering." In the lowlands of India or Pakistan there is no evidence of a prior foraging (hunter/ gatherer) population before 3100 BC. "... for nothing is older in human history than seeing the past as exemplary (the 'Golden Age'), the present as deficient, and then trying to restore conditions as they used to be. Few Egyptian Pharaohs came to the throne without undertaking to restore things 'as they were in the beginning.' That is, of course, the hallmark of the conservatism of traditional cultures. All traditional human societies justify their practices either by saying, 'that is the way things have always been,' or, if origins are in issue, by saying that the gods established things that way. Mythic accounts may or may not have been offered, briefly or elaborately, to explain how or why the gods did establish things in the proper way. Eventually the explanation becomes the thing itself, and the historical dimension is simply eliminated, as religions like Judaism, Christianity, and Islam directly present the founding commands of God in revelatory literature." "The tokens were an entirely new medium for conveying information. 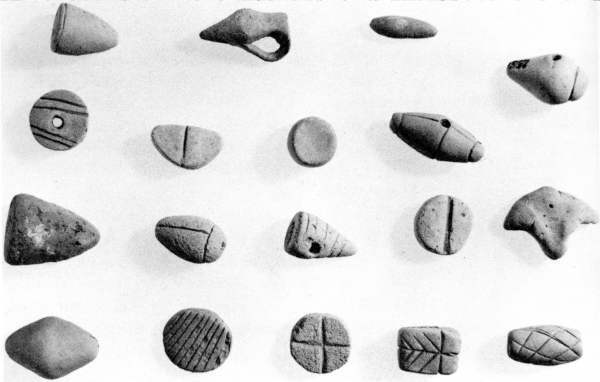 Compared to the previous tallies, the conceptual leap was to endow each token shape, such as the cone, sphere, or disk, with a specific meaning. ... The token system was, in fact, the first code -- the earliest system of signs used for transmitting information." The use of ideograms or pictograms, pictures which stood for short nouns and eventually sounds, was in use from circa 3200 BC in Mesopotamia. Cuneiform is a more rapid "longhand" abbreviation of the "pictures." The cuneiform script eventually expanded to some 600 glyphs, representing short words or sounds, and was firmly established probably by circa 2800 BC in Mesopotamia. The use of pictograms, some identical to the original Mesopotamian, continued in Egypt, but were soon reduced to the sounds of syllables. It took 1500 years before an alphabetical script was introduced. Perhaps the reason the cuneiform never moved directly to an alphabet (the cuneiform was abandoned) is because the concept of an alphabet requires something entirely different. It requires sounds -- not words -- to be mapped to a flat space. This space, where sounds have a one-to-one (analogical) relationship to marks, has to be imagined and recognized. The alphabet probably derived from the sounds of Egyptian hieroglyphs. Egypt, China, and Mesoamerica all developed mixtures of phoneme-based syllabaries, but none of them developed alphabets. The syllabary scripts of China and Mesoamerica had the advantage of being able to be read over a wide range of languages, since sounds were not strictly represented. The scripts were like magic. On the other hand, it is not at all obvious that speech consists of finite units like consonants and vowels, as is easily demonstrated from the first writing efforts of the young. The leap to representing individual sounds first shows in the prefixes used with the signs of cuneiform, as it does in the word-sound signs added to both the Maya glyphs and the Chinese script -- but they did not move beyond the specific functional addition made to the syllabaries. The first alphabet was a vowel-less set of signs introduced in Canaan circa 1500 BC, generally attributed to the Phoenicians, but probably based on the Egyptian demotic (longhand) which was already reduced to assigning sounds to glyphs. Once demonstrated, it spread like wildfire. It was quickly adopted by traders of the Levant (and by Moses). The Greeks added vowels needed for their vocalization in about 700 BC. Alphabets eventually spread even to barbarian Northern Europe where one form, known as the "Futhorc," is obviously based on Roman letters. But the ciphers of many other European barbarian alphabets show no relationship to known letter forms at all, demonstrating that it was the idea that was transmitted rather than the letters. See especially H. W. F. Saggs, Civilization before Greece and Rome (1989), who lucidly describes writing (plus other topics) in Egypt, Mesopotamia, and Canaan. "Ideas such as objectified conceptions of a mind, or even the notion of something spiritual being manifested, are of much later development. It is generally agreed that the ancient Egyptian language, like the Sumerian, was concrete from first to last. To maintain that it is expressing abstract thoughts would seem to me an intrusion of the modern idea that men have always been the same." There are disadvantages also. We are so easily convinced of the validity of our metaphorical thinking, that we end up fooling ourselves. "It is one of the lessons of logic, dutifully repeated in its textbooks, that 'analogy is not proof.' But to humans of all times, analogy must be proof. The most marvelous sense of power, intellectually and behaviorally, comes from the association of the tiniest events and observations with the nature and conduct of the great universe." Another failing of speakers of Indo-European languages, and perhaps some other cultures who are similarly inclined, is to jump to conclusions about causal connections simply because two events follow each other in time. See the chapter "Language and Causality," where this is more fully developed. I would suspect that the delay in subjective consciousness in this instance might largely be due to the limited exposure to new people. The Eastern Mediterranean, in contrast, was constantly overrun by foreign tribes seeking better environments, especially after both 1500 BC and 800 BC. The same was true of China. I wonder how much of a lack of subjective consciousness existed among the world's foraging populations, or if it had already developed. Hunters are required to be smarter than farmers. They need to previsualize their quarry, understand their habits, walk their territory, and plot a catch. That requires a lot more mental space than the rote repetition of wielding a hoe. This would suggest, in turn, that the God-obsessed farming populations were more prone to remain pre-conscious. However, in a previous chapter I have applied a pre-conscious condition to the Western European Cro-Magnon cave painters (and hunters) as a reasonable explanation of why nothing changed in their depiction technique for 30,000 years. We do remember the physical spaces that we learn to navigate as a child, the people we deal with, and thousands of other details which become assigned to near-automatic behavior. This is mainly a right brain function. "This process by which the early gods reappear in later legends under human or semihuman form ... can be observed in many parts of the world, notably in India and Scandinavia. There is no question of historical characters being invested with divinity. A detailed examination of all ancient religions, not to mention new ones, ... shows that the Gods were originally more abstract and general forces which gradually degenerated and became anthropomorphic or zoomorphic"
I would argue against the "abstract and general forces" and insist that the gods were instantly recognized as giant supernatural beings (and thus in a manner anthropomorphized), and only assumed human dimensions at a later date after they disappeared from view. It seems likely that the predilection of our ancestors (and "primitives") for colorful decorations of bright bird feathers and oversized or outlandish headdresses reflects the colorful auroral plasma displays surrounding Saturn when he stood above the pole, as well as the plume-like headgear worn by planets in glow mode plasma displays. The same would be true of the crowns of kings and the halos of saints. The note about Sahagún is from Charles Mann, 1491, New Revelations of the Americas before Columbus (2006). Mann uses this to demonstrate that the Aztec were hardly "savages." The Aztec philosophers, by the way, seem to have bested the Spanish in the discussions. Admittedly, a complex theology is not sufficient to suggest subjective consciousness, for we see the same in Egypt of the Old Kingdom and Middle Kingdom before 1500 BC. The status of consciousness ought to be sought in the accommodation of the Aztec to the religious environment of the Central Mexican region, which they invaded 200 years before the Spanish arrived, and their subsequent relationship to the Spanish. This should be considered, despite the fact that their relationship to the Gods was one of control (which reflected also in their relationship with other tribes) rather than the Mediterranean concept of having to placate the Gods. Linda Schele and David Freidel, in Maya Cosmos (1993) attribute the collapse of the Maya in AD 900 to internecine warfare, not to a religious collapse (which would be an index of the lack of subjective consciousness), as Jaynes suggested 30 years ago, based on limited information available to Jaynes at that time. Similarly the destruction of ceremonial sites in the Valley of Mexico was not always accomplished for religious reasons. Many centers were destroyed by marauding invaders. However, it is important to emphasize that pre-conscious people are almost indistinguishable from subjectively conscious people, and the only real hint pointing to a lack of subjective consciousness is the inability to deal with new situations. This was not true of the Maya and the Mexicans at the time of the Spanish invasion, but I will go with Jaynes's opinion in the case of the Inca empire, although this is influenced by my lack of knowledge of the specifics of the change in South America from indigenous religions to Christianity. The Maya and Mexica, on the other hand, seem to have integrated local traditions (or, more importantly, their philosophy) and Christianity very rapidly. See Julian Jaynes, The Origin of Consciousness in the Breakdown of the Bicameral Mind (1976), for additional details. The belief by Mesoamerican cultures in an afterlife at the time of the invasion is now disputed. See Charles Mann, 1491, New Revelations of the Americas before Columbus (2006). The ceremonial centers serviced the elite and the states. Instead of benefiting the population by supplying promises of an afterlife, the benefit was reaped in earthly terms -- good harvests, long life, many children -- through the intervention with the Gods by the ceremonial chiefs. When these were not forthcoming, the population would abandon the ceremonial centers at the drop of a hat. It is amazing that in Mesopotamia kingship and trade remained secular in most respects. The Kings were only infrequently promoted to the status of Gods, unlike Egypt, and the relationship of traders to the temple enterprises is not clear at all. The trade also supplied the elite with luxury materials. This condition arose from the fact that Sumer has no natural resources outside of agricultural products. We have no clear indication of "temple economies" in China, since there are no accounting records on clay as in Mesopotamia or testimonials carved in stone as in Egypt. But there was an economy based on supplying the elite of the very large imperial court, the provincial governors and their staff, as well as the armies, with food and luxury goods. The Maya never supported standing armies, or a police force. I disagree with Jaynes's contention that "authority" was needed to "control" groups of people through leadership, especially large groups. A look at the Plains Indians shows this is not so. See, for instance, Robert Utley, The Lance and the Shield, The life and Times of Sitting Bull (1993) or see Linda Schele and David Freidel, A Forest of Kings (1990) on the Maya. The need for authority is necessary to gregarious species, like us humans. But it need not be a matter of imposed control, and all indications from graves and houses before 3100 BC in Egypt and the Near East is that there was no leadership elite. Jaynes admits that perhaps people whose role was closest to the upper levels of leadership would be most under the influence of the hallucinating voices of the Gods. It should be remembered that the concept of "free will" does not develop philosophically until the Classical Age of Greece and the concept of "chance" remains forbidden well past the Middle Ages of Europe. Even today we see, as an example, that "moral development" -- a term designating the ability to make independent ethical judgments -- correlates inversely with religiosity, a belief in the importance of law, and in general with conservative beliefs. See Lee Wilkins The Moral Media: How Journalists Reason About Ethics (2005). Among the conditions for a plasma contact between Venus and Earth is the geometry of a transit of the Sun. Today the transits of Venus (when it moves across the face of the Sun) happen 4 times on a cycle of 243 years, in two sets of two transits, which are 8 years apart. The interval between the sets of pairs alternates between 121.5 and 105.5 years. The use of a 52-year period (and the date of 2193 BC) is from Timo Niroma (at [personal.eunet.fi/pp/tilmari], which fits well with a number of other suppositions. It is perhaps a lucky guess, but it works out well. As I will show in Appendix B, "Celestial Mechanics," the 52-year period was in effect at this time, but not at a later date, even though invoked by Velikovsky and by some other catastrophists for other time periods. This certainty about a 52-year interval is largely derived from the continued observance in Mesoamerica of 52-year intervals, but these intervals are based on the Maya calendar system based on "Tun" years, not solar years. Book 10 of the Maya Chilam Balam infers seven approaches by Venus since 3147 BC. I can easily locate four of these to 2349 BC, 1492 BC, 1440 BC, and an appearance which looked like a "close approach" in 776 BC. Considering the 156-year span of time between the "flood of Noah" in 2349 BC and the 2193 BC agricultural failure of Akkad, Egypt, China, and probably Harappa, the remaining three approaches by Venus could then be placed after 2349 BC at 2297, 2245, and 2193 BC with some confidence. Venus would seem to approach Earth every 52 years during this period, but was unlikely to have looked all that large except for its coma. For an electric interaction Venus would have to line up with the Sun on the day side of Earth, but likely never got closer than 10,000,000 or 20,000,000 miles. I'll provide estimates in the next chapter. More and more climatological and archaeological data has come forward over the years to establish a flood event, or some catastrophe, circa 2350 BC, as global in scope. This is influenced by Western Christian traditions, which hold to "the flood" as dated by Ussher to 2349 BC. The climatological decline after 2200 BC (2193 BC) is actually much better established, and the greater political consequences of this later event can be verified from Egyptian and Mesopotamian sources. "... Most sites in Greece (circa 260), Anatolia (circa 350), the Levant (circa 200), Mesopotamia (circa 30), the Indian subcontinent (circa 230), China (circa 20), Persia/Afghanistan (circa 50), Iberia (circa 70) which collapsed at around 2200 +-200 BC, exhibit unambiguous signs of natural calamities and/or rapid abandonment. The proxy data detected in the marine, terrestrial, biological and archaeological records point to sudden ecological, climatic and social upheavals which appear to coincide with simultaneous sea- and lake-level changes, increased levels of seismic activity and widespread flood/tsunami disasters. The main problem in interconnecting this vast amount of data chronologically is the application of incoherent and imprecise dating methods in different areas of geological and climatological research." -- Benny Peiser, SIS Cambridge Conference (1997). Peiser is hedging his bets here to cover both 2349 BC and 2193 BC by suggesting a range of from 2400 to 2000 BC. A few others have been more courageous and defined separate events for 2349 BC (the date is from Ussher) and the event 156 years later which resulted in a 200-year worldwide hiatus in agricultural production and abandonment of sites, apparently due to a notable lack of light. We don't really know what happened, but the clues point to an alignment with Venus. On the other hand, Timo Niroma seems to think that the first flood was very localized, suggesting that a bolide fell in the region of the Dead Sea in 2349 BC. That might have devastated lower Mesopotamia, leaving Northern Mesopotamia intact, and allowed for the takeover of those lands by the Akkadians shortly after 2349 BC. But I doubt the local nature for this event. I think the date and the cause are both incorrect. The cause for the devastation of the Dead Sea region (Sodom and Gomorrah) is a close contact by Mars. The date is 1936 BC and after. This information is developed in another chapter. A book by Moe Mandelkehr, The 2300 BC Event (2006), in three volumes, similarly presents archaeological data spanning the continents, but, again, with peculiar absences of a record from Egypt and Mesopotamia. Mandelkehr also lumps data to a single date, 2300 BC. Mandelkehr blames the destruction on a massive meteor strike. More on this in the next chapter. The first Chinese chronicles recall the efforts of two early Emperors (or gods), Yao (Yâo) and Shun, in undoing the damage of a massive flood. This is the only flood reference in Chinese literature or later "legends." Chinese scholars circa 200 BC date these two legendary figures, which represent the last two in a series of ten "legendary emperors" (or Gods) to circa 2350 to 2200 BC. James Legge, in his introduction to the translation of The Shu King (1879), absolutely insists that "Ti" (Tî), as in "Yao Ti," be translated as "God," not as "Emperor." He also reviews the slim literary threads which place the start of the reigns of Yao and Shun in circa 2350 BC. The parallels between the ten generations after Adam and the twenty early Sumerian and Egyptian kings and pharaohs (which can be equated with the ten appearances of Mars at approximate 30-year intervals) is a clear indication that we are not dealing with derivative sources. A notable parallel is that the 10 patriarchs born between Noah and Abraham are all (except the first and last) sired when their father was 29, 30, 32, or 35 years old. See Appendix A, "Chronology" for further considerations. Other Middle Eastern influences have been noted in the composition of the Bible, especially the literature of the Canaanite city of Ugarit after 1500 BC. Additionally, there are very clear Egyptian influences, especially in Genesis. The other notable compiler of ancient history is Isaac Newton. The Saturnian people (of Thunderbolts.info) have steadfastly avoided bringing the Bible into discussion. I find this a remarkable omission. The Egyptian "Intermediate Period" between the Old Kingdom and the Middle Kingdom, is variously estimated at 185 years by Manetho (circa 300 BC), 315 years by Breasted (1905), 141 years by Clayton (1994), and 110 years by Lehner (1997). It is obvious from these disparate estimates that the dates are not well established. Today the start of the Intermediate Period is dated to 2160 BC with some confidence. This is 33 years after the event of 2193 BC. Mohenjo-Daro and hundreds of other cities in the Pakistan plain of the Indus river and the parallel dried-up river Sarasvati are totally abandoned after 1900 BC as the region had turned into a desert. It is suspected, however, that the Sarasvati river may be "mythical," that is, that it represented the "river" descending from Saturn during the "Era of the Gods." The Oera Linda, a medieval book claiming to be the history of the Friesian people, calculates 2194 BC as the date of the sudden sinking of At-land -- the area between England and Holland. At the 7000 square miles of the Dogger Banks, off the coast of England, the stumps of trees are still dredged up from a depth of 50 to 100 feet (15 to 30 meters), along with mammoth tusks. The sinking of the area probably resulted from the uplift of Norway as the Ice Age glaciers melted, resulting in a sinking of adjacent regions, including the North Sea, which had been lifted up as the ice had depressed Norway. Geologically this event is located late in the Upper Paleolithic, but a subsidence at a much later date is also plausible. The Oera Linda is suspected of being a hoax in the service of Frisian nationalism, revisionist history of antiquity, and promoting a species of feminism. Arguments against its authenticity are primarily linguistically based, but at times are as arcane as the accusation that the year tallies ignore a "year zero" and thus the sinking of Atland is off by one year from 2193 BC. Of course "At-land" is readily equated by others with Plato's didactic exemplary land of "Atlantis." The date of 2193 or 2194 BC is not listed as significant by Ussher in AD 1650 or even encoded among other accepted but erroneous biblical dates by Josephus in AD 100. Dates like this did not come forward in the 18th through most of the 20th century, when Egyptian dynasties were still equated with the temporally dislocated Mycenaean occupation of Greece. "Then, abruptly, things fell apart. Sometime around 2200 BC seasonal rains became scarce, and withering storms replaced them." A number of people writing in documents published by the SIS [www.knowledge.co.uk/sis] came to the same conclusions in the 1990s. But all of them retained tentative dates, like "around 2200 BC." On the other hand, what I did was to apply Velikovsky's suggestion of a 52-year period for Venus (although he never reached as far back as 2200 BC), assumed the actual date was 2193 BC, and validated this with an arcane reference from Maya calendar information. I then applied the date also to the fall of Egypt after the 6th dynasty (the Old Kingdom). I should point out that this date also easily fits alterations in the Mesoamerican calendar. My adopted date of 2193 BC is thus based almost entirely on common sense rather than documents and ancient testimony, and thus one of my least well supported. "My hypothesis is that there were two events, the first one around 2350 BC (2345 BC? ), and the second one around 2200 BC (2193-2194 BC? ), of similar cause, but possibly independent of each other." "It [the Oera Linda] also mentions Atland (the name given to Atlantis by the 17th century scholar Olof Rudbeck), which was supposedly submerged in 2193 BC, the same year as 19th century Dutch and Frisian almanacs, following traditional Biblical chronology, gave for Noah's flood." Wikipedia might be in error here. Why this almanac date is off by 156 years from the date published by Ussher in AD 1650 for the flood of Noah, I do not know. As a fake document, the Oera Linda dates from the middle of the 19th century AD. The Chinese Annals of Shu hold that Shun, the Moon, dies in 2205 BC, that is, he "dies and goes on high." The date was estimated by chroniclers of the Han dynasty (200 BC) and should probably be 2193 BC, applying a uniform correction to the Han dates (see later text). The action is an increase in the period of the Moon which would have accompanied an increase in the orbit of the Earth also. I'll expand on this in a later chapter. Size of this page: 17122 words.